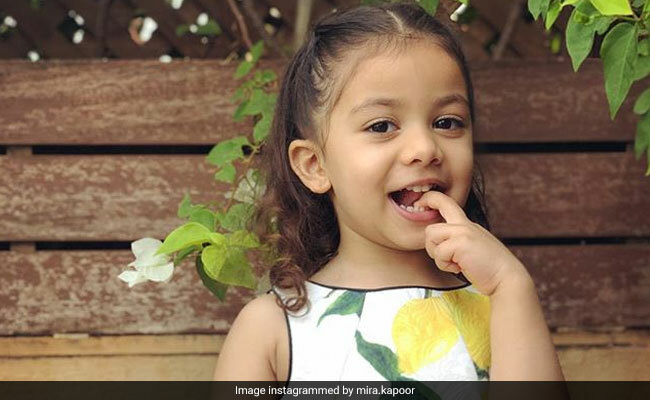 Thank you, Mira Rajput for sharing this photo of daughter Misha. The little one is growing up to be an adorable bundle of joy and Mira Rajput just can't stop framing Misha in special moments. She Instagrammed an adorable photo of baby Misha, who is all set to celebrate her 3rd birthday in August this year, and captioned it: "My big little girl. Clicking you in the same spot since the start and suddenly you don't fit in my frame! How did you grow up so fast! My darling. Naughty and kind. God blessed us." Shahid Kapoor's brother Ishaan Khatter was one of the first ones to 'like' the post, who commented: "My jaan, guchki!" Shahid Kapoor's R... Rajkumar co-star Sonakshi Sinha also commented: "Whatta cutieeee" and we can't agree more. In the photo, Misha, who appears to be very camera friendly, adorably poses for the click. She is cute as a button in a floral baby frock. It's from her school "graduation day," as mentioned by Mira Rajput on her Instagram story. We know Misha's secret superpower is being adorable but mom Mira really has to work to get Misha to pose. She once shared the story behind Misha's cute pictures with the caption: "If I say cheese will you give me a lollipop?" Misha Kapoor may be "little" herself but she's the big sister of Zain Kapoor - Shahid and Mira's second baby. Misha and Zain often feature in cute posts on Mira's Instagram. Shahid Kapoor and Mira Rajput married in July 2015 and welcomed Misha the following year. Zain was born last year.